Here are a couple of fairly detailed interviews I’ve done over the last two weeks, both on the problem of clinical trial results being withheld. As you’ll hopefully know by now from reading Bad Science, Bad Pharma, and my endless columns on the subject, medicine has a problem: the results of clinical trials are routinely and legally withheld from doctors, researchers, and patients. We started the AllTrials.net campaign two years ago to build a global campaign on this issue, and we’ll be publishing a big roundup of what we’ve done soon, along with (crucially, I think) our tactics and methods, in a spirit of pooling knowledge on how to achieve policy change for problems in science. Please do get your professional body to sign up. This week there was an amazing landmark announcement from the World Health Organisation: they have come out and said that everyone must share the results of their clinical trials, within 12 months of completion, including old trials (since those are the trials conducted on currently used treatments). This is great news, but it’s not enough. 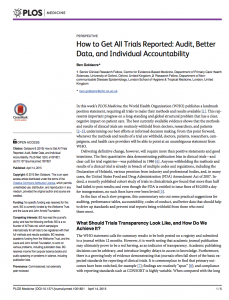 The WHO announcement was in PLoS Medicine, with a commentary from WHO staff explaining their reasoning (it’s very good) and a commentary from me, explaining why we need to audit missing data, and act on that audit data.